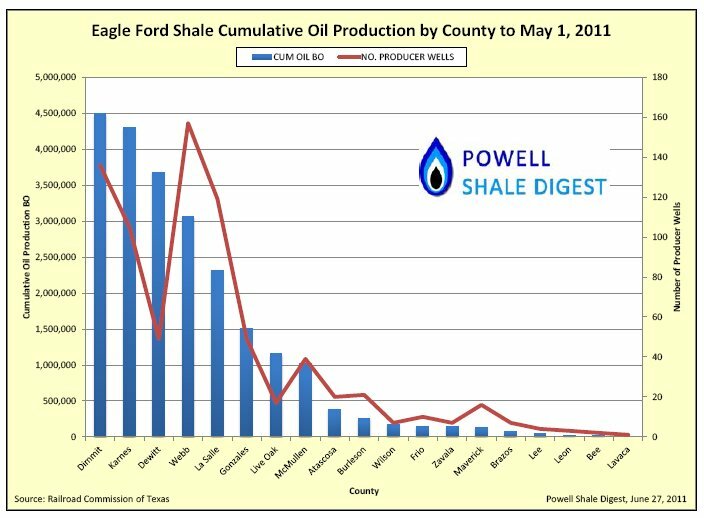 The Digest reported on wells drilled so far in Eagle Ford fields in Texas. Enough information is now publicly available to begin to see where the play is headed, and where it’s most successful. Baker Hughes’ oil rig count reached 1,000 for the first time since it began tracking oil and gas rigs separately in 1987. 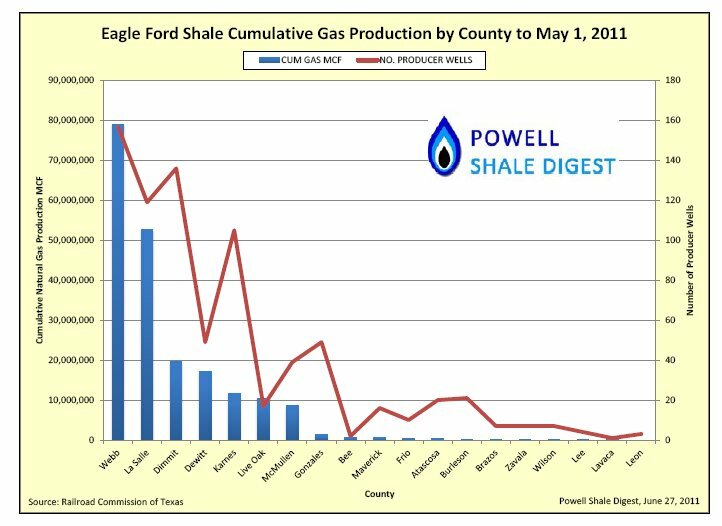 843 oil and gas rigs are currently located in Texas. 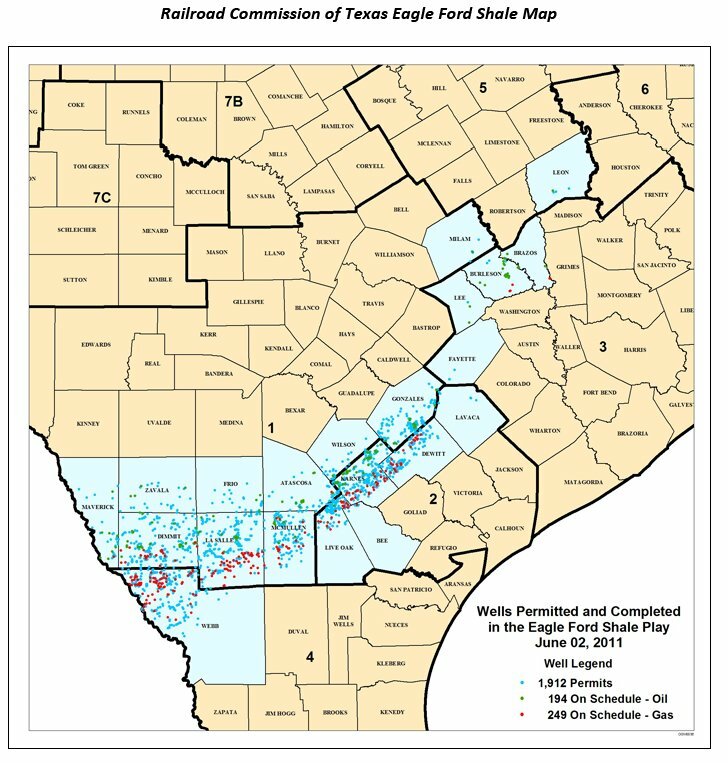 The EPA, proceeding ponderously with its Congressionally mandated study of the risks of fracing, has selected seven sites to study, two in Texas: the Haynesville (Louisiana and East Texas) and the Barnett (Wise and Denton Counties). Other sites are in the Marcellus in Pennsylvania, the Raton Basin in Las Animas County, Colorado, and the Bakken in Kildeer and Dunn Counties, North Dakota. It contends that there are too many exemptions from disclosure. Governor Rick Perry recently signed Texas’ new frac disclosure law. California is considering a similar law that will undoubtedly be less lenient. Senior U.S. District Judge Royal Ferguson refused to dismiss the EPA’s enforcement action against Range for allegedly polluting water wells in Parker County, Texas; but he stayed the case pending Range’s appeal of EPA’s action to the 5th Circuit Court of Appeals, which alleges that EPA had no jurisdiction to issue its order. Steven and Shyla Lipsky, the landowners who contend that Range fouled their groundwater, sued Range for $6.5 million. Fountain Quail Water Management, a subsidiary of Aqua-Pure Ventures, was awarded a permit by the Railroad Commission to recycle wasterwater in the Eagle Ford. Fountain Quail has already done some recyclying in the Barnett Shale. In the Marcellus in Pennsylvania, where disposal of frac water is more of an issue, producers are hauling produced water to Ohio for disposal – an estimated 1.18 million barrels between January and March. Concerns have been expressed about depletion of groundwater resulting from fracing in South Texas, especially in the current drought. Local groundwater districts, which regulate groundwater well permits and withdrawals, have no jurisdiction over wells used in the oil and gas industry, which are exempt.